Laura Farris and Emily Lewis reflect on becoming the first graduates of the MOST program. 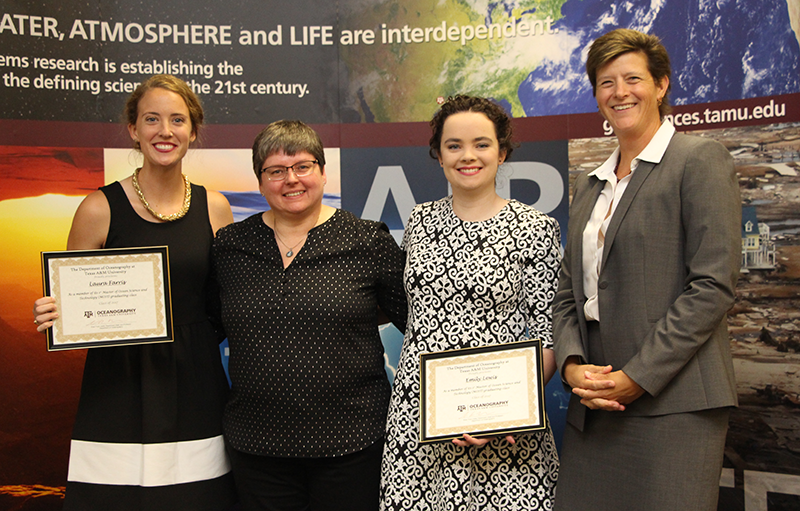 Acting Department Head Dr. Shari Yvon-Lewis (second from left) and Interim Dean of Geosciences Dr. Debbie Thomas (right) present certificates to MOST graduates Laura Farris (left) and Emily Lewis (second from right). This Spring graduation marked a special milestone for the Department of Oceanography, as the first two students of the Master of Ocean Science and Technology (MOST) graduate program walked across the stage at Reed Arena to receive their degrees. The MOST program is a non-thesis, professional Master’s degree offered through the Department of Oceanography that prepares students for careers that require strong data analysis (big data) and presentation skills including: meteorologist, marine technician, coastal planning and management, ocean observing systems and more. Within the last week of their enrollment at Texas A&M University, both graduates were asked to reflect on their experience in the MOST program. To Miss Laura Farris, joining the 3+2 degree offered the opportunity to explore Geoscience beyond her main focus of Atmospheric Sciences. Q: What prompted you to pursue the 3+2 program? Q: What was the best part of the program? When reflecting on her experience, Miss Emily Lewis, also a Meteorology student, had similar, positive remarks. As alumni of Texas A&M University, both Ms. Farris and Ms. Lewis plan to pursue careers in the private weather forecasting or data analysis sectors, applying the strong communication and analytical skills gained through the MOST program. Students have the opportunity to join the MOST program via two routes: either as a 3+2 Fast Track Bachelor plus Master’s program, complementing one of numerous Geoscience degrees at Texas A&M University – or through the standard graduate application offered through Apply TX. For more information, please contact Dr. Wiederwohl at chrissyw@tamu.edu.